Q. What equipment do you need to go caving? I only ask because if a Trivial Pursuit victory depended on my knowledge of potholing, I would be left floundering with 5/6s of a pie. The very idea of exploring the depths of middle earth excites me but scares the bejesus out of me, probably because I saw The Descent. I’m no caver, not for me the dark, creepy and ever decreasing holes in the ground where my larger frame would be constantly screaming “diet!”. 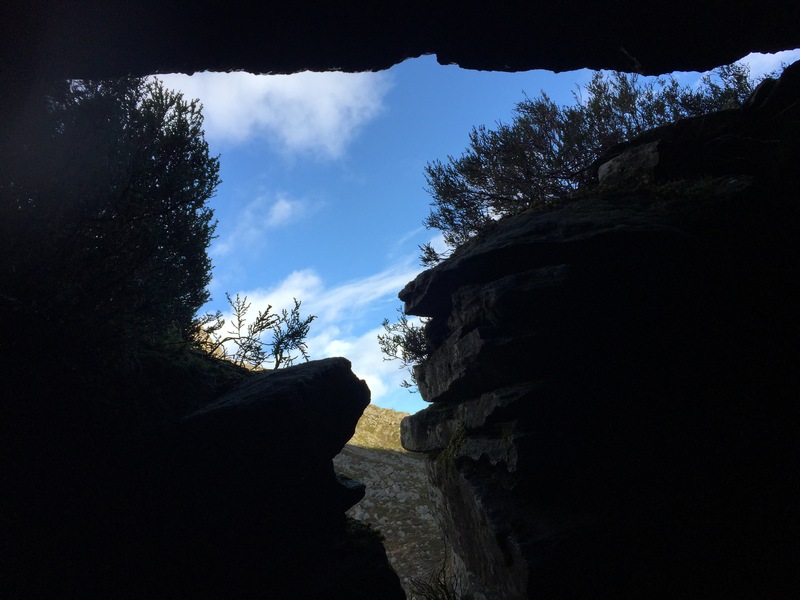 But I do like the idea of natural howffs or shelters, which give you a genuine sense of protection from the wind, rain and snow, cut into or made of rock such as Bonnie Prince Charlie’s Cave near Elgol on Skye. 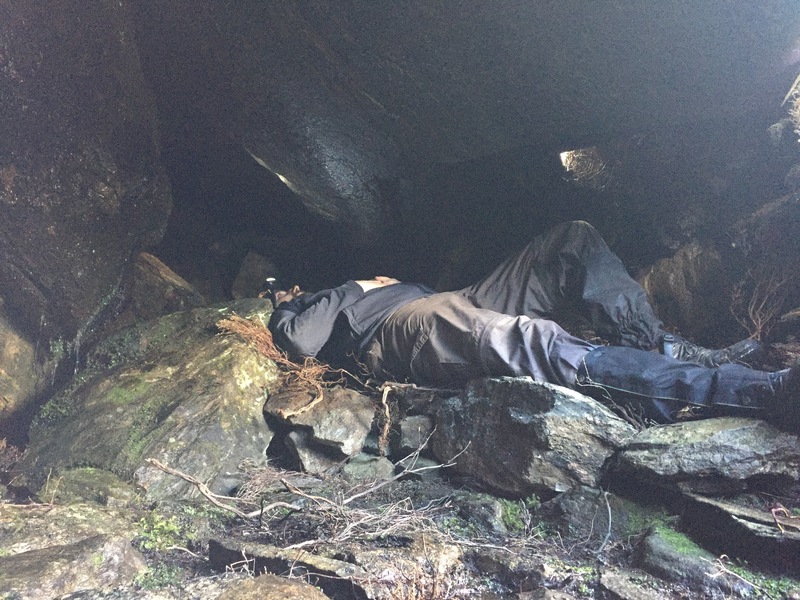 I recently heard about a cave in Glen Almond near Amulree. Not a deep cave. And no evil creatures apparently. 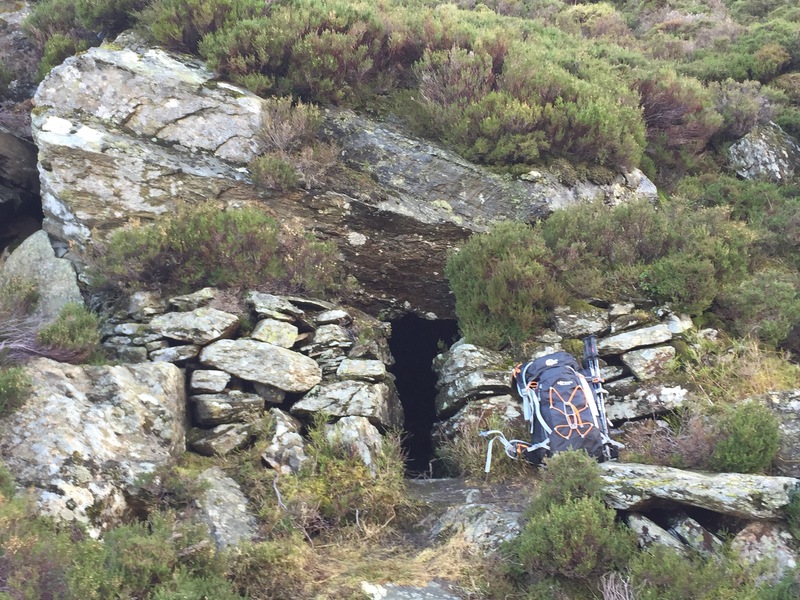 Thieves Cave (Thiefs Cave on OS maps) can be found at the back-wall of Coire Chultrain. There isn’t much information online, but it’s link to reivers and catarans (and no mention of Neil Marshall) made it sound worthy of a expedition. As it turned out, the cave has mostly collapsed, leaving a pile of particularly large, slabby boulders. 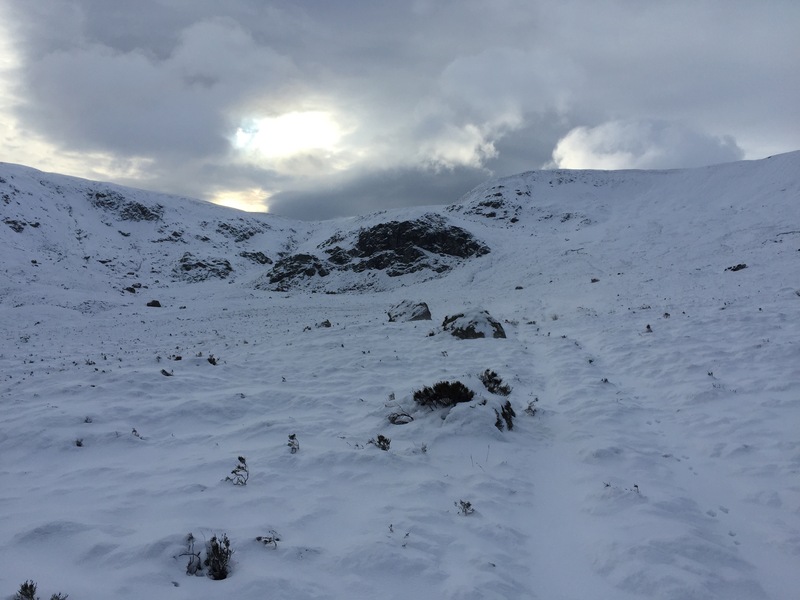 It was at least a lovely, snowy walk up from the bridge at Sma Glen, but what really made the trip was that some enterprising soul has placed a geocache on the site. And a well stocked one at that. I swapped trinkets. 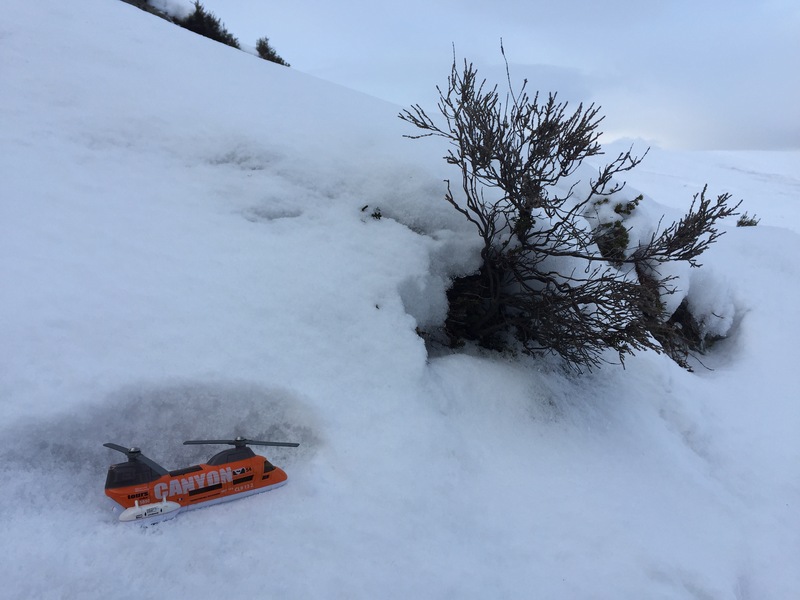 However, my new helicopter wasn’t quite big enough to fly me out of the corrie. Continuing my search for dark places, yesterday I went looking for Cave number two of the week. Balnamoon’s Cave can be found in Glen Mark, near Edzell. The hiding place of a Jacobean laird on the run, I was hoping for better luck this time, something I could clamber inside and get a sense of protection from the wilderness. After a mornings walking through light snow and then an hours rock hopping around the hillside looking for the tell-tale vertical slit, I was in luck. Water streaming down the back wall like a fountain, but roomy and with two heather single beds already created by some expert howffers, it inspired some mixed thoughts along the lines of “Who last slept here?” and “I’d like to give that springy bed a shot”, which I duly did. But actually, I was well chuffed with my find. More than big enough to hold a crowd, lots of protection from the elements and a feeling of stepping back in time, the cave was just deep enough to be a shelter, but close enough to the sunshine to escape any strange predators that Hollywood might create. Sitting under one 500 tonne rock was scary. So to ask my initial question again, what equipment to you need to go caving deep under ground? The answer is simple. You don’t need ropes, rucksack or even a helmet. You need balls. Big ones.